Is The DASH Diet Really Good For Gout? There was breaking news in the gout world these past few weeks regarding a study published in Arthritis & Rheumatology conducted by the American College of Rheumatology. Stephen Juraschek, MD, PhD, of the Johns Hopkins University School of Medicine, and his colleagues studied 103 adults with pre or stage 1 hypertension and participants were randomly chosen to consume either the DASH diet which stands for Dietary Approaches To Stop Hypertension or consume a control diet (your average American diet) and were further fed low, medium and high levels of sodium for a month, each in random order. Participants were given differing amounts of sodium – 1.2 grams (low), 2.3 grams (medium), or 3.4 grams (high). The higher figure equates to the standard American diet. Now for those who don’t know the DASH diet emphasizes consuming fruits, vegetables, low fat dairy, whole grains, little meat and must be lean, fish, nuts, beans, yes beans and low saturated fatty foods. Sound familiar? If you’ve read my book and the posts on this site, it almost mimics my gout diet advice. Anyway this DASH showed that it did in fact lower uric acid levels for the participants on average about 0.35 mg/dl. In subjects, who had uric acid levels over 7 mg/dl, the DASH diet lowered uric acid by more than 1 mg/dl. Now where it gets a little weird is that the increased salt intake is taking all the credit for lowering the uric acid levels. 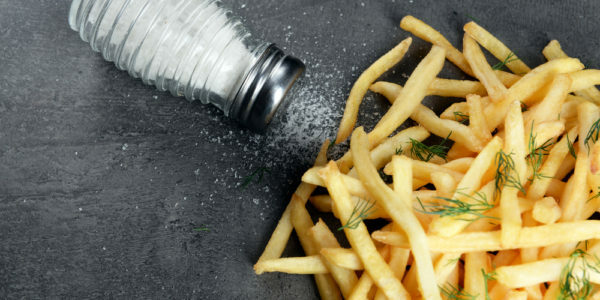 The researchers hypothesized that reducing sodium/salt intake would lower uric acid but they found the opposite was true. On top of it all, they are saying that the salt intake of the typical American diet, which is a lot and more salt than your body needs, is the main reason that the participants’ uric acid levels were lowered. The researchers go on to say how they don’t the mechanism by which increased sodium/salt intake decreases uric acid. This is unclear for them. Furthermore, now the researchers recommend the DASH diet as an effective, non-pharmacologic approach to prevent gout flares. Dr. Juraschek says, “Physicians may now confidently recommend the DASH diet to patients with gout in order to lower uric acid levels.” Really? So now physicians will recommend the DASH diet so gout sufferers can eat more salt that risks them suffering from high blood pressure and causing other problems to their health. Best to stick with gout diet plan that includes 10% of your daily calories as protein in lean meats and fish. 10% of your daily calories as in low dairy fat like milk, cheeses, yogurt, butter etc…and 80% of your daily calories should consist of complex carbohydrates as in fresh fruits, vegetables, whole grain breads, pastas, rices, nuts and beans. You don’t need the extra salt, natural foods have enough salt in them already to meet your required daily needs, so like they say “take this study with a grain of salt” and best you don’t follow the DASH diet by increasing your salt intake all of a sudden. You don’t want to go from gout to high blood pressure as well. To common sense and to your health! Do not get deceived. Is the Atkins Diet Good for Gout? If he is following a gout diet as outlined on my website and book and still gets attacks, plus takes his medication and still has gout. Then he has an advanced stage of gout. Has his doctor tried to increase the allopurinol dosage? Does he do frequent blood tests, preferably every 6 months to see where his uric acid lies? Make sure to also ask his doctor to check his kidney health. Try and find a rheumatologist for him. Sometimes a second opinion doesn’t hurt cause his GP might be a bit inexperienced when it comes to gout. I know some GP’s look a medical book on what amount of colchicine and allopurinol to give at the onset of gout. I am 31 years old and I got my first gout attack at the age of 16 it was my left knee, it swelled and caused pain with inflammation. It took around two months to recover from that and after that I started experiencing pains in both my knees, whenever I took a good walk or little bit of running and since then I got 4 attacks of gout within an interval of 3 to 4 years on either of my knees one at a time. This time I got an attack in mid of July 2017 and still suffering with inflammation and pain in my right knee. My uric acid level is 6.8 now. Is there any permanent solution for this? Please reply. Go visit your doctor and most likely he/she will prescribe you colchicine for the inflammation and allopurinol to keep uric acid levels in check and avoid future gout attacks. My name is Hersh and I have gout; also the level of my uric acid 8.6, but my problem is that my uric acid has not decreased at all. I drink 10 bottles of water 0.33 liter and never eat red meat. I take 40 psc colchicine drug but has not decreased my uric acid levels, I don’t know what to do? My doctor can not decrease my uric acid levels, he just gives me the drug for prevention,can you advise me ? Not much I can tell you here then seek the advice of another doctor, seek a 2nd opinion if I were you. If the medication is not working then the doctor must increase dosage and/or change you to another drug. What you can control on your end is your diet. Do as I preach here on this website, read all of the posts, take notes if you have to and follow the gout dietary advice that is available to you. Drinking plenty of water is important too. I stumbled across your site recently in search for help and have enjoyed it. I recently was diagnosed with gout but I believe I have suffered from it for some years. After my recent diagnosis, I made a commitment to strict eating, no alcohol, cherry juice and other remedies. I’ve noticed that after a month and a half of being very careful and steadily losing weight, that I’ve had attacks closer together. People have told me that this may be my body getting rid of old crystals from previous attacks but it is depressing and discouraging. Any thoughts on this? thank you! Yes losing weight quickly increases your risk of getting gout attacks and your body getting rid of old crystals without any medication involved will also do that. I am writing you to ask for some advice regarding my gout. Before, my gout is in my left ankle and the attack usually occurs if I ate something that is forbidden. I will take medicine for pain and allopurinol prescribed by a doctor and it will go away and I will not have an attack for months. But last month I had an attack this time in my right ankle, this is the first time I had an attack on my right ankle, usually it is my left ankle that gives me problem. I went to see a doctor and was given medicine for pain and swelling together with allopurinol. After taking my meds I had relief but to my surprise after just 12 days I had another attack on the same right ankle and I had not eaten any food that is bad for me. Again I visited a doctor and I did not eat any meat or fish while taking medicine again. After 15 days I had an attack again on the same ankle. I was just wondering why I am having this repeated attack while I am still taking acupurinol because I was advised to take it for 2 months. I am also not eating fish or meat only vegeatables, low fat milk and some cheese and mayonnaise. Hope you can give me some helpful advise because I am in Saudi Arabia and doctors here are not that reliable they seem to not take their patient seriously. Thank you very much, sorry for my lenghty mail. It probably means your uric acid levels are going higher and may have to do with worsening kidneys not being able to expel uric acid. You may need to increase your dose for allopurinol. Remember eating well and drinking only water if you can is the best thing you can do for your health if you want to live longer and have a better quality of life. I got my first gout attack 6 weeks today and still hobbling along with the pain shifting to different parts of my left foot. I finally started taking prescription anti-inflammatory a few days ago. I modified my food to low salt and minimal sugar, low-fat dairy, no yeast and chicken, certain recommended fish, veggies. My uric acid test was 3 times the normal level and this was likely due to diuretic prescribed a few months ago for hypertension. I was under the impression that the pain subsides after 24 hours and yet my persists? Any thoughts, suggestions or recommendations? Ask your doctor if he can prescribe you Colchicine instead. That usually takes away the pain quicker, usually within a few days.